Award-winning author Patricia Sandberg shares her stories of life in a mining town on the north shore of Saskatchewan’s Lake Athabasca. Patricia Sandberg, author of the award-winning book “Sun Dogs and Yellowcake: Gunnar Mines — A Canadian Story,” spoke with the Investing News Network about a uranium discovery that shaped history and the lives of the 800 people living in the Northern Saskatchewan mining town of Gunnar. The true story of the remote Canadian mining town is told through old photos, art and stories from former residents. Everything began with Gilbert LaBine, a Canadian Mining Hall of Fame inductee known as Canada’s Father of Uranium. LaBine and his brother founded Eldorado Gold Mines in Manitoba during the mid-1920s and went on to finance prospecting trips around Great Bear Lake in the Northwest Territories. In 1930, LaBine discovered silver mixed with pitchblende, now called uraninite. At the time, pitchblende was valued for its radium content, which was mistakenly believed to be a miracle cure. “Radium was then the most valuable metal in the world. It was trading for C$75,000 a gram, if you can imagine. [LaBine] proceeded to set up a mine on the shores of Great Bear Lake. What was interesting about that mine is its by-product, its waste product, in fact, was uranium, and uranium in the 1930s had no value,” Sandberg said. The mining camp was called Great Bear, and then Cameron’s Point, Echo Bay and Radium City before finally becoming known as Port Radium in 1937. However, falling radium prices, Canada’s entrance into World War II in 1939 and higher-than-expected production costs forced LaBine’s mine to close in 1940. “It wasn’t until World War II came along that people started looking for uranium, when they discovered fission and the potential for the atomic bomb. This mine had the only significant source of uranium in North America,” Sandberg explained. The Canadian government was approached by Britain and the US to supply uranium to develop an atomic bomb, and the Port Radium mine was reopened. A refinery set up by LaBine in Port Hope, Ontario also refined purer uranium concentrate from the Belgian Congo that had been stored in New York for the Manhattan Project. Sandberg’s grandfather, Fred Sandberg, had worked in construction for the Beresford mine, which operated under LaBine’s company Gunnar Gold Mines in Manitoba during the Great Depression. Fred Sandberg moved to Port Radium in 1943 to work as construction superintendent. The Canadian government became increasingly concerned about maintaining secrecy considering the mine was owned by a publicly traded company. In 1942, the government secretly bought LaBine’s shares in the company and asked him to purchase other shares on its behalf so as to not alert the stock market. On January 28, 1944, LaBine’s company, now called Eldorado Mining and Refining, was nationalized without explanation. Sandberg said the US and Canadian governments began promoting uranium exploration during the Cold War. Their efforts led to two discoveries in Canada: one in the Elliot Lake region in Ontario and the other in the Athabasca region, which supports uranium mining and exploration to this day. Sandberg’s grandfather and her father, who worked as a carpenter, soon moved to the northern shores of Lake Athabasca for work. The Uranium City settlement that was built was intended to be a nucleus that connected various mining camps, but Sandberg said LaBine was determined to build his own settlement. The remote mining town of Gunnar was formed, and Sandberg, who lived there from the ages of three to 11, said the town’s children had a lot of freedom. “We disappeared after we ate and didn’t come home again until we were hungry. There were bears up there [and] all other kinds of wild animals and dangers from exposure to weather, and everybody survived, which is a miracle,” she said, adding that a critical connection has been lost in the modern mining camp model. “People who lived in this town appreciated and valued what they did. Granted, there were some risks with uranium that they didn’t realize, but they really valued the life and they appreciated the efforts that the mining company made to make their lives good there. I feel like we have lost that with the fly-in fly-out [model]. We don’t have that appreciation. We don’t have a family connection to a place, and I think we miss out by that,” Sandberg continued. The Gunnar mine started producing in 1955 and shut down in 1963 as it reached the end of its life. Sandberg said US discoveries of uranium had created a surplus in the market, resulting in the closure of mines surrounding Uranium City. One notable exception was the Eldorado mine, or Beaverlodge operation, operated by Eldorado Mining and Refining, which continued producing uranium until the early 1980s. Within that period Eldorado Mining and Refining changed its name to Eldorado Nuclear. Sandberg interviewed over 100 former residents of Gunnar to write her book as a way of preserving their stories, fond memories of place and a piece of Canadian history. She said several of the former residents have passed away since she started writing in 2014. “I feel like we could do a much better job in the mining industry of telling our stories. There are so many stories that are untold about mining in Canada. If we’re not telling those stories they’re going to be lost. Not only that, but it is a way of reaching people who are not in the mining business and letting them understand what mining contributes not just to individual people but to our country,” she said. There is still work to be done at Gunnar before it can be laid to rest. In 2006, the federal and provincial governments signed a memorandum of understanding to split the cost of cleaning up the Gunnar mine site. The town’s abandoned buildings overlooking Lake Athabasca have been demolished, and the Saskatchewan Research Council said remediation work is expected to be completed by 2022. Eldorado Nuclear was dismantled in 1988 and merged with assets of Saskatchewan Mining and Development Corporation to form Cameco (TSX:CCO,NYSE:CCJ). 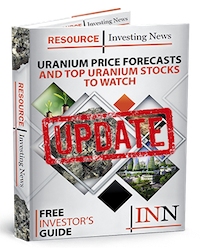 There are currently several exploration-stage uranium projects in the Athabasca Basin, and operating mines include Cameco’s McArthur River-Key Lake mine and Cigar Lake mine. In total, those mines produced 22 percent of the world’s uranium in 2016, according to the World Nuclear Association. Sandberg now lives in Surrey, BC and is a former securities lawyer who worked for mining companies with operations around the world. She is a full-time writer and “Sun Dogs and Yellowcake” is her first book. Playing softball in Gunnar. Photo courtesy of the McFadden family. Open-pit mining. Photo courtesy of B. Schorn. Gunnar head frame. Photo courtesy of T. Beckett. A brisk boat ride on Lake Athabasca. Photo courtesy of P. Sandberg. Curling. Photo courtesy of the McFadden family.